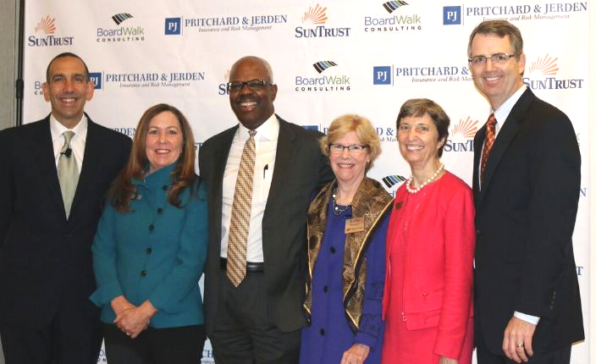 Pritchard & Jerden co-hosted the 5th Annual Nonprofit leadership Conference on October 21st at the Atlanta Botanical Garden’s Day Hall. The event brought together nearly 200 nonprofit C-Suite and board representatives from Atlanta’s premier nonprofits to discuss best practices for making a nonprofit board extraordinary. The event featured panel discussions and a keynote address from Dan Cardinali, CEO of Independent Sector. The first panel discussion was a “Fireside Chat” between the CEO of Families First Kim Anderson and its board chair, Julie Salisbury. Kim and Julie exemplified how a board chair and CEO work hand in hand to drive the organization to achieve the mission. The chat was moderated by Elizabeth Kiss, President of Agnes Scott. The second panel included four guests — Quadirah Abduhl-Rahim of Future Foundation, Joe Arnold of SunTrust, Virginia Hepner at Woodruff Arts Center and John Somerhalder at AGL Resources — who discussed hot topics for contemporary boards. The panel was facilitated by Mary Pat Matheson of the Atlanta Botanical Garden. The conference is hosted by Pritchard & Jerden, SunTrust and BoardWalk Consulting. The Nonprofit Leadership Conference is designed to present forward thinking ideas, best practices and leading strategies to help nonprofits reach maximum efficiency. Plans are in place for the 6th annual conference in October, 2017.